So far, nothing truly mysterious has occurred. However, John “Jack” Jasper, choirmaster in the Cathedral town of Cloisterham, has expressed a morbid curiosity in the stonemason Durdles’ craft. More particularly in the crypts beneath the Cathedral. Jasper’s behavior and addiction to opium make him suspect. But is this set up for what is to come or might this be a clever ruse? Resuming with Chapter Six, part of the second installment that originally appeared in May 1970, the narrative shifts to the Reverend Septimus Crisparkle “feinting and dodging with the utmost artfulness” as he practices the art of boxing. He is a man of thirty-five, single, and resides in Minor Canon Corner–“in the shadow of the Cathedral”–with his widowed mother. At morning breakfast, the Crisparkles pour over a letter announcing the imminent arrival of two wards, Neville and Helena Landless. “An unusually handsome lithe young fellow, and an unusually handsome lithe young girl; much alike; both very dark, and very rich in color; she, of almost the gipsy type; something untamed about them both; a certain air upon them of the hunter and huntress…” Neville is to stay with the Crisparkles and be tutored by Septimus while his twin sister will stay at the Nuns’ House. 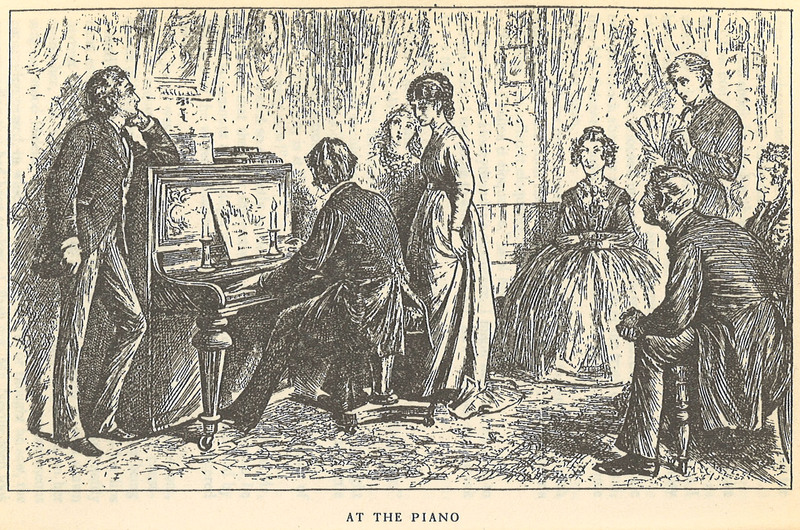 From left to right: Neville Landless, John Jasper, a ghostly-looking Rosa Bud, Helena Landless, Miss Twinkleton, Septimus Crisparkle, Mrs. Crisparkle, and holding the fan, Edwin Drood. The Crisparkles arrange for a dinner and invite Miss Twinkleton and Rosa Bud from the Nuns’ House, Edwin Drood and his uncle, Jasper, to come and meet the newcomers. After the twins’ guardian has deposited them, in Chapter Seven, we learn that Neville and Helena are orphans from Ceylon. “It was well he died when he did, or I might have killed him,” says Neville in an aside to Septimus. Neville is referring to his reviled stepfather who beat his sister and maltreated them both. Septimus is shocked by the admission, and Neville regrets his brashness. Or perhaps hot-headedness? The short conversation makes Septimus “uneasy. It hinted to him that he might, without meaning it, turn aside a trustfulness beneficial to a mis-shapen young mind and perhaps to his own power of directing and improving it.” He invites Neville’s confidence and learns that though the Landless twins were set on quarreling and breaking away, they have been warmed by the reception giving them. “Not under any circumstances,” replies the lady. Later Helena and Rosa, pledging to be friends to one another, confide in each other. Rosa tells Helena how she feels haunted by Jasper. “He has made a slave of me with his looks. He has forced me to understand him, without his saying a word; and he has forced me to keep silence, without his uttering a threat. It is curious that Rosa lacks passion for her betrothed, but fears that same passion coming from Jasper. Yet she admits Jasper has never spoken to her about that. His looks alone cause her to tremble. More curious still is that Jasper’s love for Rosa was apparent to Helena, but she needed to ask if Rosa loved him. Read along with The Poisoned Martini each week and examine the the origins of mysteries in the earliest examples of the genre. Next week, stop by for Chapters Eight and Nine.